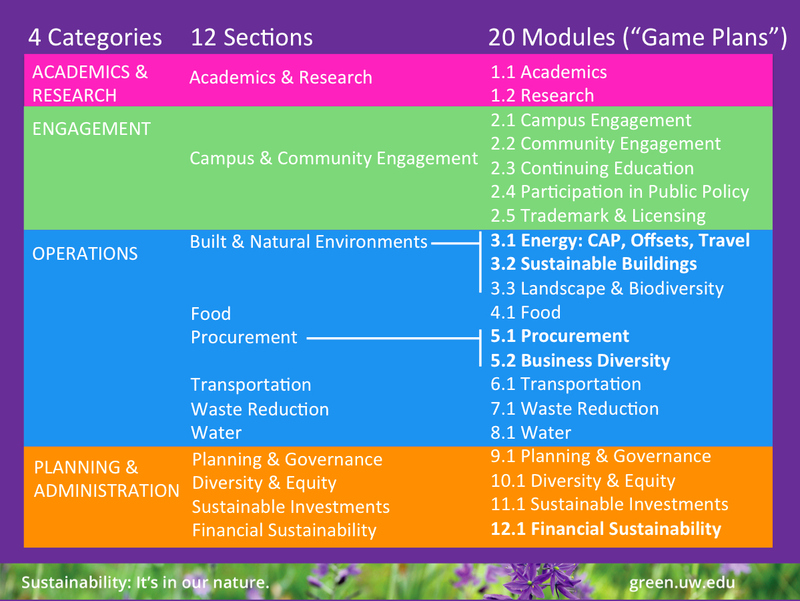 UW Sustainability identified six goals for the 2018-2019 academic year on which the office would focus. One of those goals was to create a campus wide (tri-campus) sustainability plan. Although UW's Climate Action Plan (CAP) has been in place since 2009, some sustainability subject matter areas that are important parts of campus academics and operations were not addressed in the CAP, such as sustainability in the curriculum and biodiversity on campus. The campus-wide sustainability plan will expand on some areas that currently exist in the CAP, while also creating new plans for other sustainability subject matter areas. UW Sustainability chose to use the Association for the Advancement of Sustainability in Higher Education (AASHE) Sustainability Tracking, Assessment, and Rating System (STARS) as a guide for creating our sustainability plan. STARS is a transparent, self-reporting framework for colleges and universities to measure their sustainability performance. In addition, other relevant reporting and rating systems such as the UN Sustainable Development Goals (SDG) and the US Green Building Council's Leadership in Energy & Environmental Design (LEED) were used in order to assure we are achieving the highest level of performance possible. Staff and financial resources are often limited at universities. This is no different at UW. To move forward with creating and implementing a campus-wide sustainability plan for UW, UW Sustainability has decided to proceed by creating small, focused 'module' plans that together will eventually make up the full sustainability plan. UW Sustainability has chosen to use sports as a metaphor and inspiration for our plan. Sports as an analogy works quite well for many things on our campus. An instructor creating a new course creates both a syllibus and individual lesson plans for each class session. A researcher starting a new line of research may have an overall theoretical idea but designs individual experiements to test hypotheses. And a doctor treating cancer in a patient has an overarching plan for addressing the illness but often has smaller challenges to address in pre- and post- treatment phases of curing the disease. Just like in our student athletics programs, we want to be the best at everything we do. The best in academics, the best in research, the best in innovative healthcare, and the best in sustainability in higher education. To this end, we will be developing an an overall 'SustainableUW Playbook' with individual modules, or 'game plans' as we like to call them, for addressing particular sustainability subject matter areas. The game plans that are targeted for completion in calendar year 2018 appear in bold in the table below. As individual game plans are completed, new game plans will be identified by leadership for development. The creation of each game plan is made up of three phases, a "ready" phase, a "set" phase, and a "go" phase. Go Phase - Active, Approved Plan. Once the plan is approved, program management of the plan going forward begins. This phase of the plan includes a milestone to celebrate the creation of the plan, regular check ins on the plan, reporting, etc. Outcomes include an active game plan for the area, a plan that is aligned with AASHE STARS credit areas for optimizing performance, and annual reporting. The process for developing each of the game plans will likely be very different for each of the plans. Some topics are more complex than others and scheduling for the core teams alone can be a very different task depending on the team makeup and how busy team members are. In order to ensure consistency, we have created a general framework for the game plan development process. This framework ensured consistency across the plans but also allows for flexibility if additional steps are needed or if the timeframe for development of the plan needs to be extended.